Scientists working at the Paul Scherrer Institute (PSI) have created a very specific type of material from over 1 billion magnets placed in a specific configuration. Astonishingly, its magnetic properties now change with temperature, just like water can be liquid, solid and gaseous based on temperature. Image credits: Heyderman et al. This material was constructed to confirm or infirm some previous theories; some researchers suspected that the material may behave this way, but until now, it was just a theory. 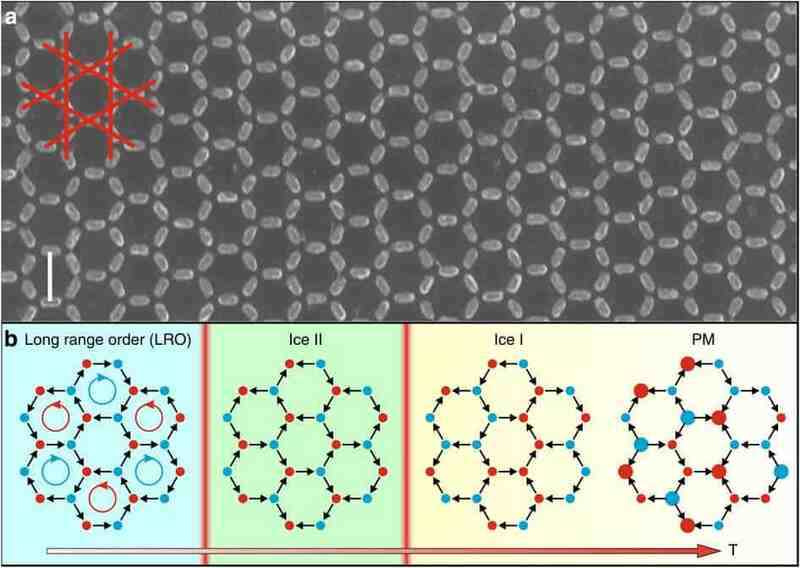 They used over 1 billion nanomagnets, and placed them in very precise positions in a hexagonal lattice. The magnets are only 63 nanometers long, and are shaped roughly like a rice grain; the total area covered by them was about 5 millimeters. The advantage here is that while individual atoms can’t really be placed with such accuracy, magnets can. Then, they started testing on the magnetic material; they found that while heated, the magnets maintained a more or less random direction. But as they cooled off, they began to lock in particular positions. Specifically, they noted three phase transitions – just like with water. This has major implications for engineering future materials – it enables the creation of new states of matter, or even better – developing a specific state of matter that changes its properties based on specific needs. “The beauty of it all: tailored phase transitions could enable metamaterials to be adapted specifically for different needs in future,” explains Heyderman. Specific applications could be in information transfer or sensors that measure changes in magnetic properties.